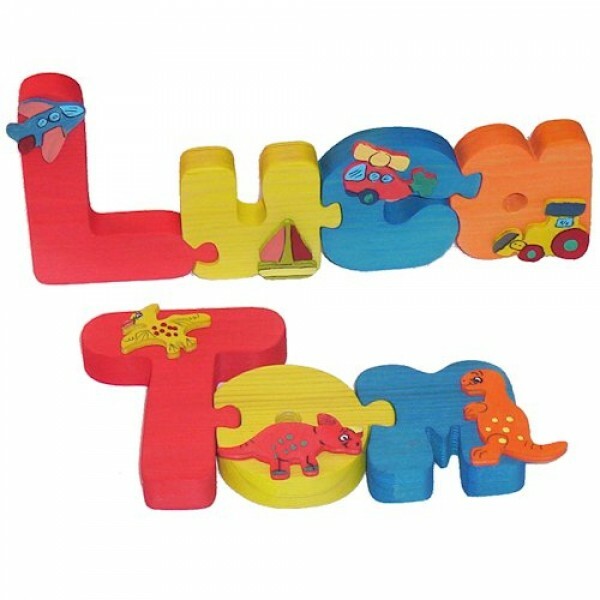 These chunky free standing wooden jigsaws are decorated with wooden cut outs in either a Jungle, Space, Dinosaur or Vehicle theme. The jigsaw is finished in brightly coloured stains. 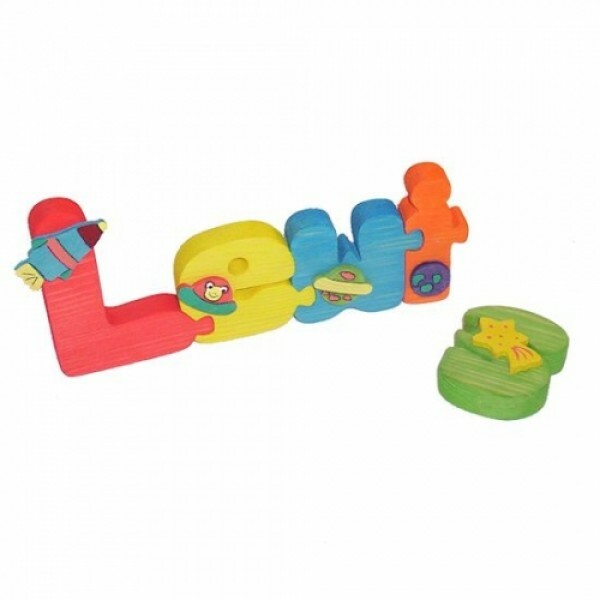 Not only a great decorative feature but also a fun way for a child to learn how to spell his name. 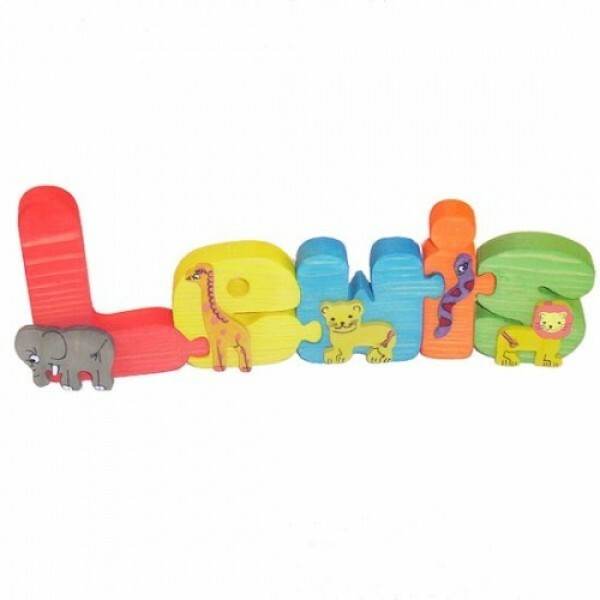 Names are priced £1.70 per letter, please ensure that the name required corresponds with the number of letters ordered in the drop down box. This product has a stain finish allowing the natural beauty of the grain to show through resulting in contrasting shades of colour on each jigsaw piece (see images). Size: 9cm high x 1.5cm thick. This cute little beech stool is based on a traditional milking stool and is available in several designs (see design drop down box below). Each stool is hand decorated in bright colours, sealed and finished with natural beeswax. The stools have 4 turned legs with stretcher rails and are made from solid beech. 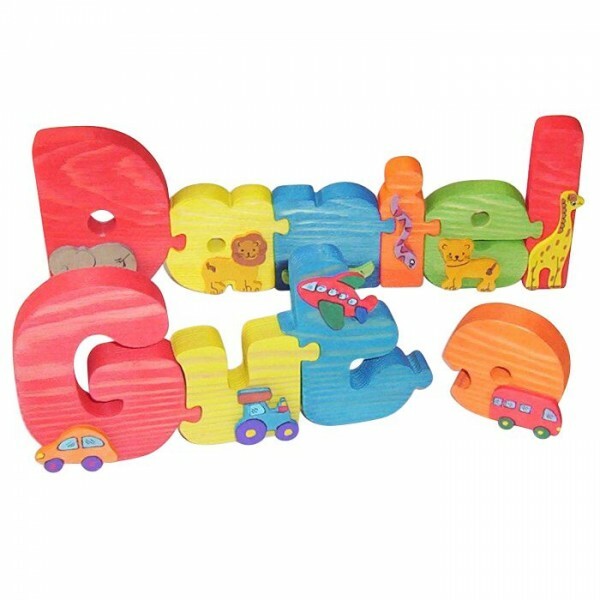 Names and messages can be added free of charge, a great keepsake gift for christenings, ..
A chunky solid wooden 3 dimensional name peg in bright colours and decorated with wooden cut outs in either a Vehicle, Dinosaur, Jungle or Space theme. A fun hanger for coats, dressing gowns, bags, etc. Names are priced per letter, please ensure that the name required corresponds with the number of letters ordered in the drop down box below. 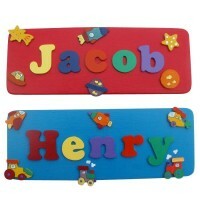 Size: 10cm high ..
Brightly coloured name plaques for bedroom and playroom doors. These plaques are available in several colours and designs to match our other products (see related products below). The plaques are handmade by Hometime Crafts making each one different and unique. Letters, shapes and back board are cut from birch plywood and then stained and painted to give a bright col..